Discussion in 'WIP (Work in Progress)' started by JDB, Aug 30, 2008. Here is my first beta of my arena map Sunder. SS.1. - The brushes your using for the rooves, they look like they're way too thick, its kind of become common practice to use 4 unit thick brushes, 8 sometimes works depending on the circumstances but anything higher than 8 doesn't work well. You could always go for 3 or 6 depending on exactly how thick you want it but 4 and 8 are easiest to work with and 4 looks best usually. Underneath the blue/white building I wouldn't use a wood texture, especially for the walkway infront of it, wooden sides to a concrete top looks a bit odd, pick a concrete/brick texture for the sides. 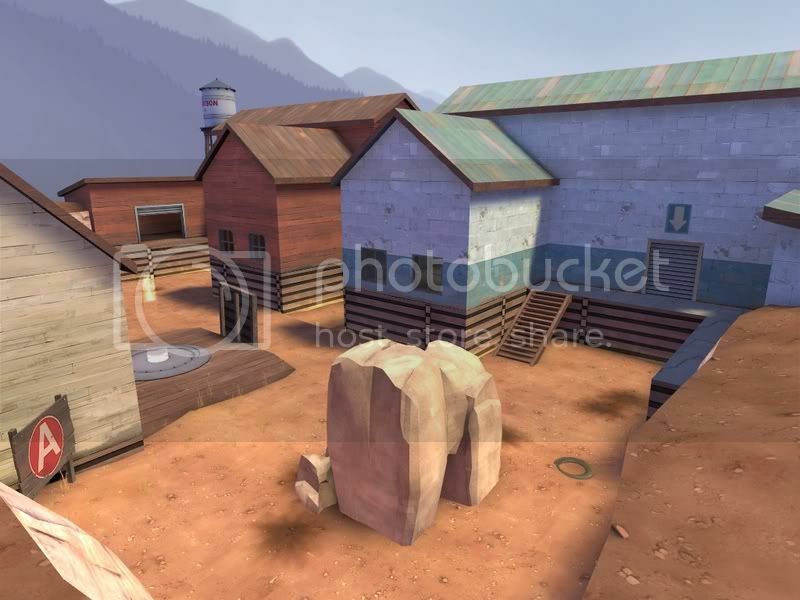 # of props needs to go up, I count 5 in total (excluding the control point) if you were to compare that to a screenshot of a similar sized are in a valve map there might be 20-30 props. SS.2. - Not a huge amount to say on this one, more props obviously. Try shifting that metal I-beam texture so that therivets arent cut in half, might look a little better. SS.3. 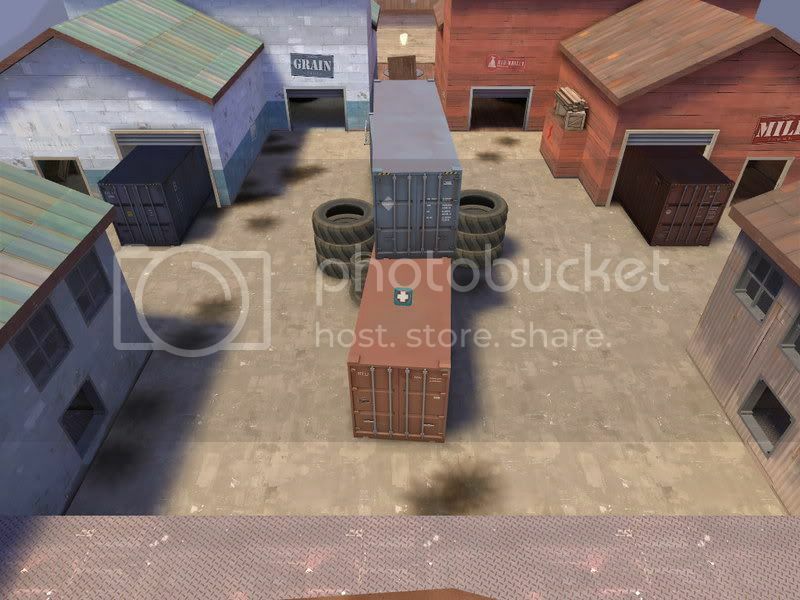 - Thats a bad place for a healthkit, especially in arena, its biased towards soldiers and demomen who can get up there, and then stay up there with a large healthkit. Using the sme metal windowframe on both sides doesn't look so good, try having a wooden one for red. to stay in keeping with their style. The wood texture on the sloping sides of the rooves, if you haven't already (can't quite tell because of the compression of the SSs) rotate it so that its inline with the slope of the roof. And I wouldn't use a wood texture either, since the roof isn't made out of wood, why would the sides be wood? Again, prop density needs to go up a lot. All that said, its a promicing start. SS.1 - I'll drop the roofs down to 4 too see how they look as they are a bit chunky. 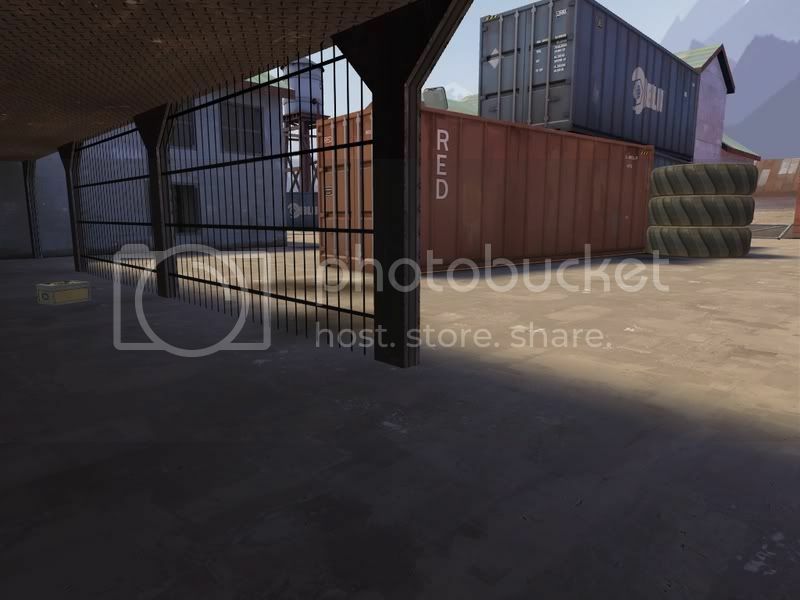 SS.3 - The Health pack can be reached by every class by using the walkway that connects both houses either side of the Health pack. Demomen and Soldiers can jump up their by rocket or sticky jump but they risk losing more life then they gain. Also if they stay up their they will be a sitting duck for Snipers, Heavys and Demomen. It is low on props but i am not worried about this yet as i want to test the gameplay like the Health Pack situation before i go crazy propping the place. Thanks for the feedback Youme. medium health pack will prob kill the whole purpose of arena, and if im right then theres another medium health pack on the other side..
CP should also be in the middle, it's always in the middle. For the wooden texture you've used on the bases of those buildings, reference badlands, it is trimmed with a white wooden texture. I advise to use this, or another wooden texture to trim it. Also, displace the same texture left or right so that it is alligned visually to the size/lengths of the buildings walls. If you understand what i mean? The new forest skybox is nice and all, but it's there so we don't have to look at desert maps any more. Either use a desert skybox, or make a green map. There is only one Health Pack. Why does the CP have to be in the middle? "Also, displace the same texture left or right so that it is alligned visually to the size/lengths of the buildings walls. If you understand what i mean?"